SYRIA’S GOVERNMENT IS allowing the evacuation of nearly 30 critically ill people from a besieged Damascus suburb, where hundreds requiring medical treatment have been prevented from reaching hospitals minutes away. Ingy Sedky, a spokeswoman for the International Committee of the Red Cross in Damascus, said four patients were allowed to leave on Tuesday and 25 others are expected to be let out in the coming hours. It is not clear if all will be evacuated in one batch today or over several days. The ICRC is partnering with the local Syrian Arab Red Crescent to handle the evacuations. SARC spokeswoman Mona Kurdi said the evacuees arrived in hospitals in government-controlled Damascus, just a few minutes’ drive away. “There are many more people who need to be evacuated. We hope this will be only the beginning,” Sedky said. The evacuees included three children, as young as one-year-old, and one adult. The patients, who travelled with family members, needed immediate treatment for cancer, kidney failure and haemophilia. At least five detainees were evacuated from eastern Ghouta late on Tuesday. For weeks, the UN has been calling on the government to allow some 500 critically ill people to leave the suburb for treatment and to expand aid groups’ heavily restricted access to the area. 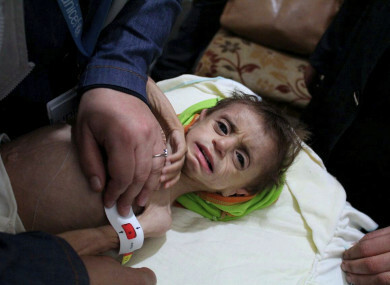 Activists in eastern Ghouta have circulated photos online of severely malnourished children. The UN says one in eight children in eastern Ghouta is going hungry, up from one in 50 in May. Turkey’s President Recep Tayyip Erdogan said his government is working with Russia, a close ally of Syrian President Bashar Assad, to try and evacuate some 500 people from eastern Ghouta, including about 170 women and children, who are in urgent need of humanitarian or medical assistance. Turkey is a leading supporter of the Syrian opposition. Rights groups say the government has used siege tactics across Syria to starve local populations and force rebels to surrender, which would amount to a war crime. The government denies the allegations, blaming shortages on rebel groups. Eastern Ghouta was one of the first areas to rise up against Assad when Arab Spring protests spread across the country in 2011. Government forces surrounded the area in 2013, but tunnels and smuggling allowed residents to bring in food and medical supplies. The government tightened the noose earlier this year following victories against insurgents in other parts of the country. Assad’s rule is more secure than at any time since the uprising began, and the opposition is largely confined to the suburbs around Damascus and the northwestern rebel-held Idlib province. “De-escalation” agreements brokered by Russia, Iran and Turkey have reduced the violence in most areas, but efforts to reach a political solution to the conflict remain stalled. Russian Foreign Minister Sergei Lavrov has said that Russian-brokered talks slated for next month were crucial for reaching a settlement, and would not interfere with UN-backed negotiations, which have made virtually no progress since they began in 2014. Several dozen Syrian opposition groups have refused to take part in the Russian talks, accusing Moscow of failing to rein in Assad. Email “Critically ill adults and children evacuated from besieged region of Syria ”. Feedback on “Critically ill adults and children evacuated from besieged region of Syria ”.